It is mid-January already! And, if I’m completely honest I don’t remember much of it – December either. I don’t remember much of these months because they fly by in such a flurry (ahahaha). 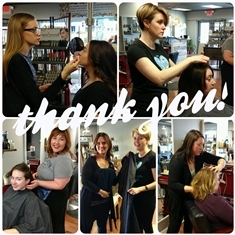 What I can recall of December are some wonderful segments, such as our Salon Enso staff party. I work with some very amazing individuals. These ladies are truly the BEST. We love to spend time together but it is rare that our schedules allow at the same time so our holiday party is where we share laughs, food, snuggles and cheer. At our holiday party last year we completed our first ever service project where we made and donated fleece blankets to Ronald McDonald house. This year it was decided we’d stick a little closer to home and bomb Lancaster with our love – SCARF bomb that is. 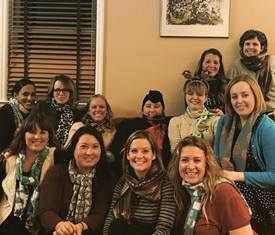 For those not in the know, scarf bombing (also known as the Wrap Up project or Chase the Chill) involves leaving cold weather gear (namely a scarf) out for those who are less fortunate. Darcy, the owner was inspired by a Lancaster Central Market Facebook post and decided it would be our “gift” this year as we had so much fun making and giving last year. 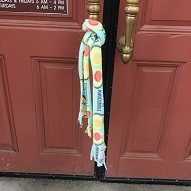 Two weeks after our party Darcy made her way to downtown Lancaster to distribute our warm weather wear to the delight of many in need individuals. She said she barely made it two blocks until all 20 plus scarves were handed out! December is a fabulous month for giving as everyone has the holidays on their mind. The clients at Salon Enso are always more than generous with thoughtful, monetary and edible gifts. Food banks see surpluses of food and many organizations reach their fundraising goal. However, should we really stop once the calendar ticks off December 31st? I’ve noticed an ad on television recently that highlights the fever pitch of giving in December, but notices that the need can still remain well into the New Year. It showcases a bustling soup kitchen in prep for the holidays then the scene transitions into the same room, sparsely populated with no food on the tables. 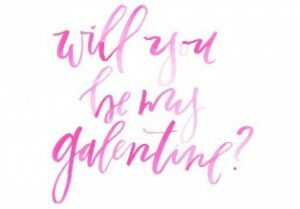 It made me think of giving shouldn’t be just a one-time thing, but perhaps all year long. I understand we’ve got crazy credit card bills to pay and it’s cold outside. And I’m not talking about huge donations of time or money…but simple gifts throughout the year go a long way. My mom is one of those individuals that is generous in spirit all year long. Rarely does she show up to an appointment empty handed. Nine times out of ten she’s brought along some treat for all of us gals to share. 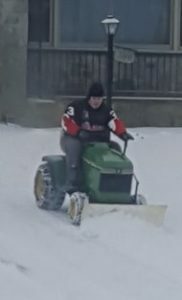 My neighbor recently got a plow attachment for his tractor and plowed our driveway one snowy afternoon as my husband and I were still at work. I am more than happy on mornings when I get to work early to skip over to Grand Central Bagel and buy coffee for my co-workers. A restaurant around the corner from my house allows guests to “pay forward” a breakfast for someone less fortunate. My husband’s students donated boxes and boxes of gently used clothing and supplies to people in Puerto Rico. All these small acts add up and they don’t need to be completed or done throughout the month of December alone. I’ve said it before and I’ll say it again. Giving looks good on everyone…and if it does, why not be attractive all year long? 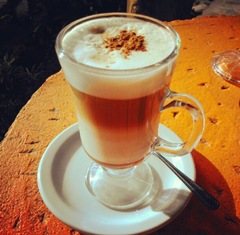 I guarantee the joy in someone’s eyes when you surprise them with a warm scarf, cup of coffee, breakfast, hug, special treat or all of the above will make you sparkle all year long. 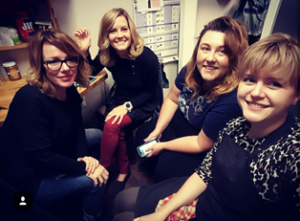 A week or so ago whilst perusing Instagram (which according to my husband is my favorite hobby) I happened upon a post from celebrity stylist Riawna Capri. She is a California hairstylist famous for styling the locks of Julianne Hough, Nina Dobrev, Steven Tyler, etc. In my freshman and sophomore years of high school I was obsessed with a little-under-the-radar-band known as No Doubt. In reality, I was enamored with their lead singer Gwen Stefani. Not only was her last name practically my first name but she was this ideal combination of all things I wanted to be at 15 years old, but didn’t have the guts to (now I wouldn’t bat an eye!). I don’t think I need to tell you any other way, kids – July is HOT. Whereas we had a cool June, July has more than made up for it. We are in the depths of summer, folks! And whether you believe it is the heat or the humidity, the rising temperatures have us all seeking some relief. One of the most popular ways to cool off is to head to our local pools. Nothing is more refreshing in 90 degree plus heat than a head to toe plunge. Swimming is the third most popular sport throughout the world for the simple reason that anyone can do it. It also increases flexibility and burns calories. There’s also the social aspect that the pool provides (thespruce.com). I remember spending quite a bit of my childhood challenging my cousins to races, flips and cannonball contests at our local pool while my parents caught up with my aunts and uncles. It truly is a beneficial to all individuals type of activity, whether 3, 33, 63 or 93. Everyone benefits from a dip in the pool – well almost everyone…. Anyone who remembers swimming as a child, most likely also remembers the green meanies. The lovely swamp colored hue our hair took on after spending hours upon hours in a pool. Those with flaxen strands are more susceptible to a puce (that’s a shade of green) colored mane however everyone could benefit from a little preventative hair TLC. And I so dutifully volunteer to serve as your lovely lock saving lifeguard – rescuing you from pool induced tangles and unwanted olive tinged ends. First up, a little back story – green hair is caused by minerals that occur in chlorinated water. Copper is one of those minerals. The best example of this is Lady Liberty. She was gifted to us by the French and is actually made of copper. But what color do we know her as? Green! This is what happens when that metal oxidizes. 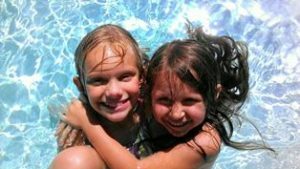 In pool water, the copper bonds with the chlorine in the pool and those molecules will bond to the hair strand. Factor that in with sunlight and you have a perfect recipe for Kermit colored strands. Gotta love science! My grandmother always used to say an ounce of prevention is worth a pound of care. I never understood what that meant as a child, but now as an adult it makes sense. If you spend a few minutes taking preventative measures, you avoid a big mess at the end. Thanks for that life preserver, Grandma. The same could be said for fighting off the green meanies in hair. Purchase a regular spray bottle and fill it up with some filtered water. Before you go to the pool, completely saturate your hair with the filtered water and braid it, bun it, ponytail it – whatever floats your boat. This prevention method fills your hair with fresh water, leaving little to no room for the hair to soak up the chlorine and other minerals in the pool. You could even take this one step further by coating the wet hair with conditioner (I like Aveda’s After Sun Care Masque). This then makes your hair strand like a duck feather. Ducks are oily birds and rarely spend any time drying off since their feathers naturally repel the water. Same can now be said for your hair! Be sure to pack both items in your pool bag and reapply as you feel the hair start to dry. Easy peasy prevention! If you just got home from the pool and forgot your spray bottle of filtered water, hop in the shower with a bottle of chelating shampoo. A chelating shampoo gently encourages the mineral deposits in the hair to bond with it, ensuring that it rinses out of the hair and down the drain. Aveda’s Sun Care Hair and Body Cleanser is FAAAAAAABULOUS for this. It gently gets out the copper and chlorine deposits, but leaves the hair feeling soft and not stripped. It also helps rinse all the chlorine from the body as well. 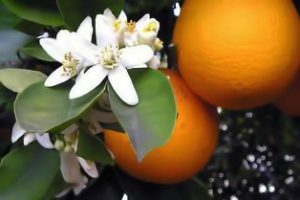 Its sweet orange tinged scent will leave you feeling fresh as a summer breeze too. Summer’s here so let’s get out and enjoy it! Take a dip without worry and look hot while you stay cool – and may the only green you see be the garnish in your drink. If the onset of the 21st century has seen anything in the world of beauty it would be the way consumers have become savvier about their products. We are focusing as much on what goes outside our body as inside. If probiotics do us good on the inside they must do us well on the outside too. Items that have been known and “trusted” for years are being boycotted for hosts of red flag ingredients. Words like paraben and phthalates have crept into our vocabulary. We read labels like encyclopedias – furiously scanning for anything that may cause danger. I get it. I am notorious for selecting anything that will rebuke the chances of disrupting my endocrine system or causing cancer. My goal is to have a long healthy life and to look GOOD while I do it. So I’ll eat the spinach salad and take the eye cream that is free of formaldehyde, thank you. Back in the dark ages… (more commonly see “my teenage years”) I mean twenty-ish years ago, before we knew that micro beads clogged our waterways and nanoparticles tampered with our lungs the “trend in labeling was something called cruelty free. In a roundabout way cruelty free essentially means that the cosmetic product in question was not tested on animals. Animals are often used to determine the safety of a product or its ingredients; however unlike a human an animal cannot offer their consent. By FDA (Food and Drug Administration) there is no legal definition of cruelty free. 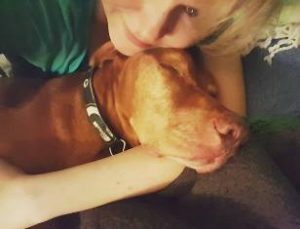 Therefore several watch groups have taken it upon themselves to be advocates for our animal friends. PeTA or the People for the Ethical Treatment of Animals, is the largest animal rights organization in the world (onegreenplanet.com). It is a non-profit organization and easily the most recognized with chapters in various countries throughout the globe. 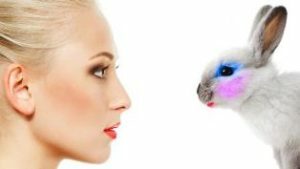 PeTA has established a program entitled Beauty without Bunnies which allows consumers to search a database of more than 1500 companies allowing them to select companies with cruelty free products. Everyone at Salon Enso is a proud pet owner and animal lover; therefore it was doubly exciting to see Aveda officially inaugurated onto PeTA’s Beauty without Bunnies list. This spring we were proudly able to display the PeTA bunny logo and talk about what Aveda is and has been since its inception in 1978 – PEOPLE tested. 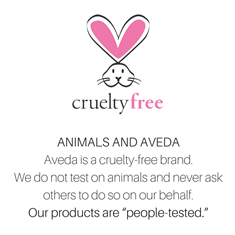 Aveda made a commitment many years ago to never test on animals or ask others to do so on their behalf. Sometimes companies can source out ingredients and have a third party test those on animals. It is against Aveda’s ethical stance to do this. 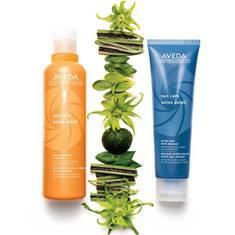 Their beliefs on animal testing can be traced to the Aveda mission line of “caring for the world we live in”. That stance can also be backed up by taking a look at the grounds that surround the Aveda facility in Blaine, Minnesota which is a certified wildlife sanctuary, or by the conservation efforts in Nepal which help save the environments of the snow leopard and wild yak. They believe strongly in making the world a better place for all creatures. 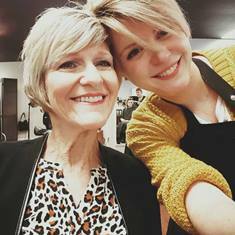 Beauty without Bunnies is another way Aveda is able to set the bar for environmental leadership within the world of beauty. Knowing our products are safe, gentle and cruelty free. It is just another way that makes everyone, whether they are two legged or four, look and feel their best.